Sunshine on a Rainy Day – the Sunmark Check Delivered! Today we received the check from the All Over Albany Sunmark Credit Union Grant! 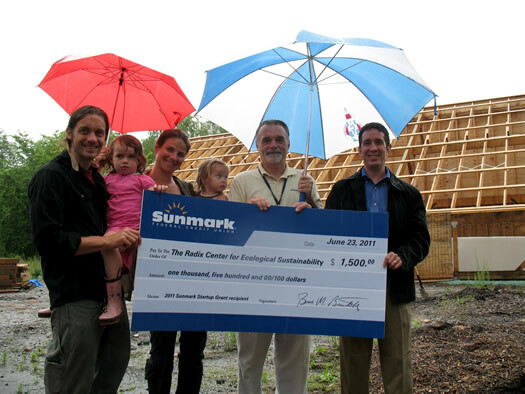 Thank you Sunmark CEO Bruce Beaudette and Director of Marketing David Weinstein, and Mary Darcy and Greg Dahlmann from All Over Albany, who all stood in the rain to present the check. We are really excited to buy supplies to build our aquaculture system! For details of the aquaculture system that was funded click here. ← All Good Bakers is the first business to join the Community Compost Initiative! !